I'm on the welcoming committee in my neighborhood and wanted to make our new families a little something special. 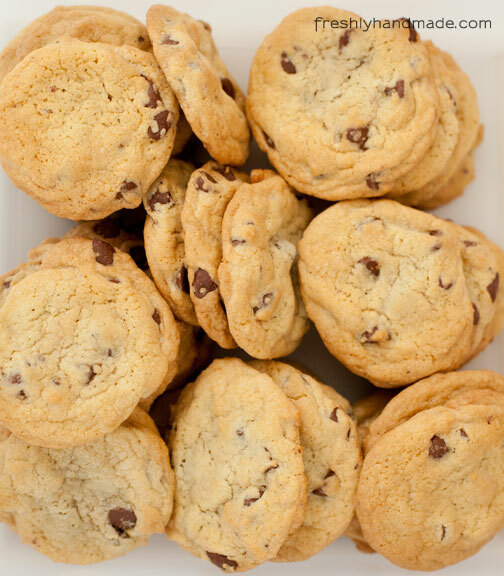 Chocolate chip cookies seemed like a simple, yet comforting way to say "welcome." Problem is, even though I bake, my last attempts at these cookies have not been as I had hoped. So when my husband volunteered to make the cookies, I said "sure." I had no idea he could make such perfect chocolate chip cookies. Yum! 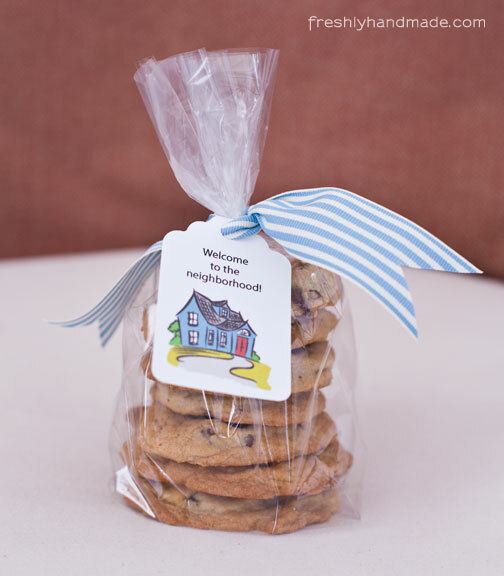 Add a few simple packaging touches, and we had a special and freshly handmade treat to give to our new neighbors. I had a nice time making the deliveries and meeting our new families. I hope they enjoy the neighborhood as much as we do. Do you have a special gift that you like to give to new neighbors? 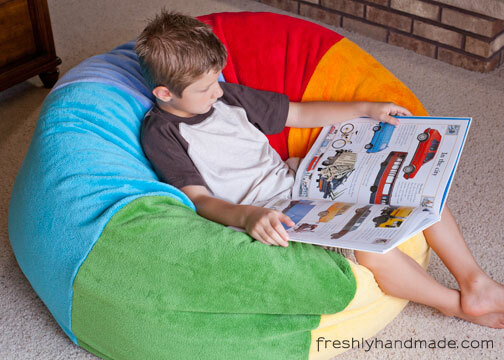 I made two little kids pretty happy this weekend by making them each a super comfy and fun rainbow bean bag chair. And I am happy to no longer have 5 ginormous bags of bag o' beans laying around the house. 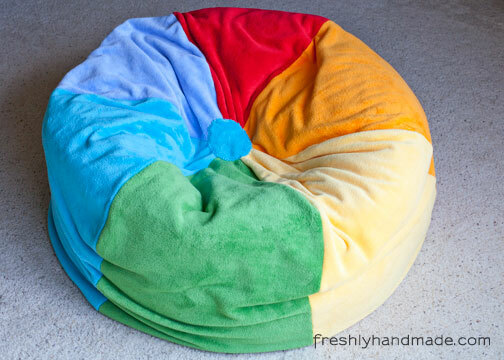 I used the Adult-Sized Bean Bag Chair tutorial from the Michael Miller Fabrics blog as a guide for measurements and assembly, but instead of using cotton for the outer cover, I used ultra cuddle fabric. 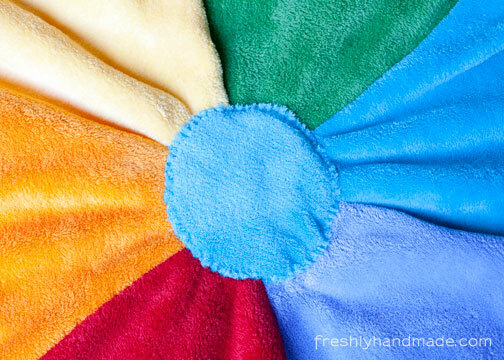 It's SO soft and perfect for this type of project. A word of caution when working with this fabric, however. 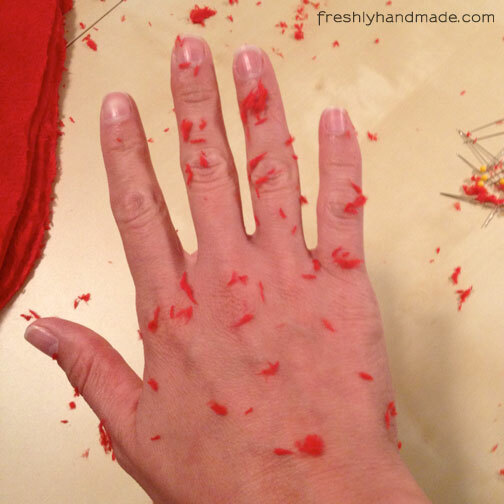 You get fuzz everywhere. I mean everywhere -- your clothes, your skin, the floor, up your nose. I even inhaled a little bit. 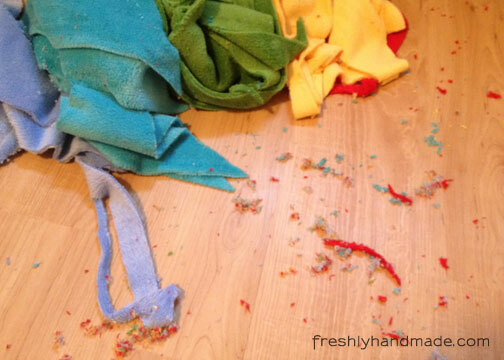 But, if you don't mind the clean up, the end result is so worth it. I used all the same measurements and seam allowances as the tutorial, but because the ultra cuddle is a lot thicker than say a quilting cotton, I had to make some adjustments. I used a walking foot with looser tension and as long of a stitch length as my machine would allow. 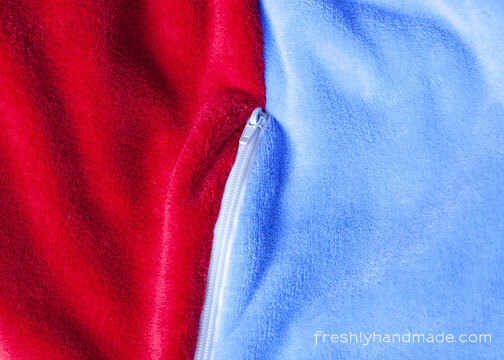 Even then, I had to practically pull the two layers of fabric through as I stitched. For the appliques on top and bottom, I simply cut out a circle in the ultra cuddle and used a blanket stitch to sew it down. The tutorial calls for a hidden velcro strip as a closure, which would have been great, but there was no way I was going to be able to sew through two layers of ultra cuddle, plus the velcro, so I opted for a zipper. I found a 30" zipper in the upholstery section at my local fabric store. I don't mind that it is visible. If I were to make another, however, I think I would have used an even longer zipper if I could find one. It would just make it that much easier to remove the bean insert for laundering. And here is just one of us enjoying the new bean bag. I have to admit, I've had my fair share of relaxing on it and so has my husband. I was tired from cleaning up all that fuzz! Before my sewing machine got injured and had to be taken in for repair, I was able to finish my most recent quilt design. 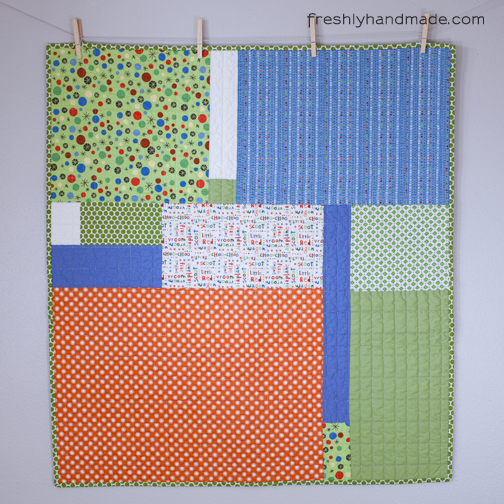 I call it the 9 Design Stripe Quilt because, well, the pieced strips are made up of 9 different prints. I've had this coordinating fabric for a while and wanted to put it to good use. The prints are made up of a variety a dots, swirls, starbursts, stripes, medallions and flowers in turquoise, green, brown and cream. 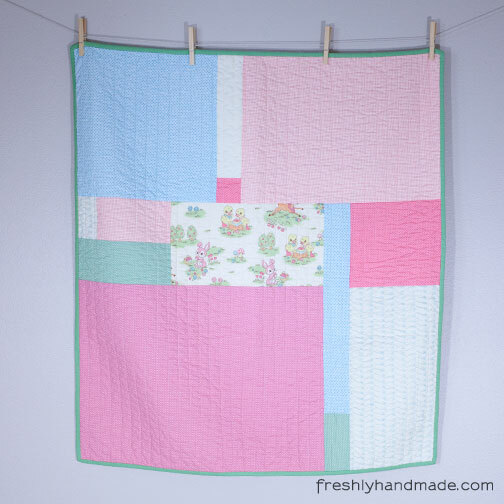 I would consider it to be a girls quilt, but it is not overly feminine. 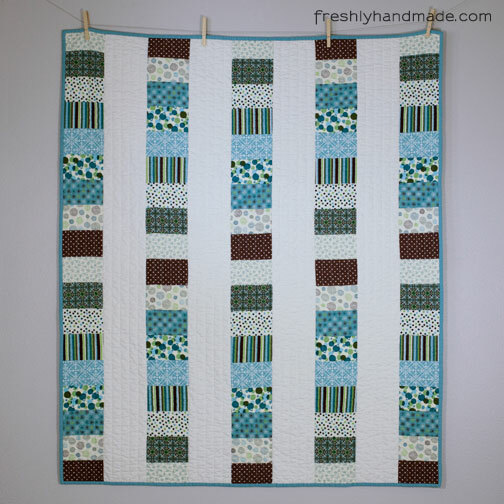 The vertically pieced stripes are paired with a cream solid kona cotton. For the binding, I used a matching turquoise solid. For the backing, I used a coordinating polka dot print. I had an extra strip of the pieced fabric from the front, so I incorporated that horizontally on the back. I quilted it vertically only stitching 1" apart. 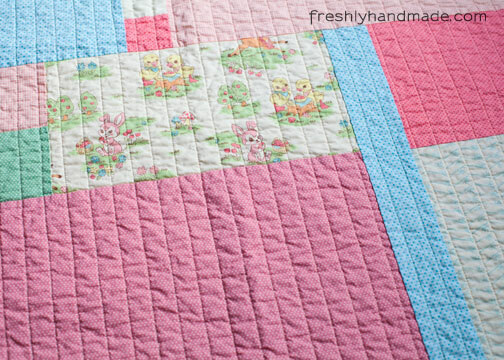 This quilt has been machine-washed (gentle) and tumble-dried, giving it an antique wrinkled look. 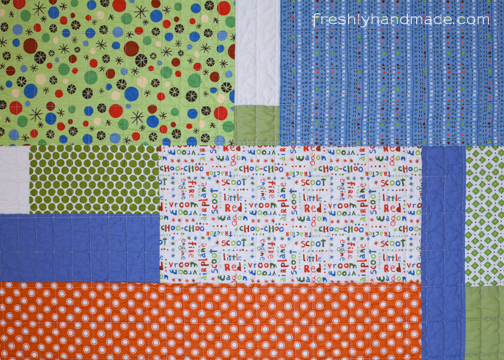 My last post featured the girl's geometric baby quilt that I designed. See the post here. I mentioned that I was working on a boy version using the same pattern. I thought I'd share the finished product. 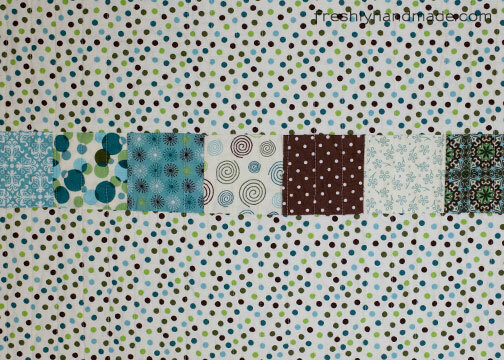 The fabric selection for the front incorporates several prints from the Riley Blake Scoot collection, a couple Denyse Schmidt designs, along with cotton solids and a random scrap. The backing is Tiny Toys in Cream from the Riley Blake Scoot collection. 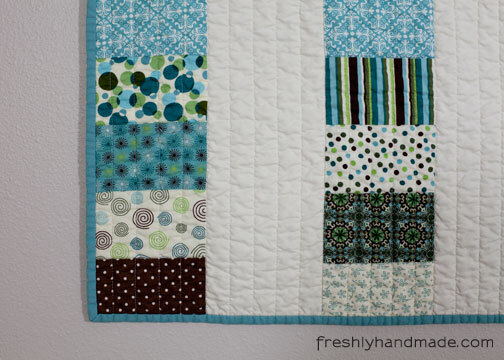 This quilt has been machine washed and tumble dried, giving it the wrinkled look that I like. Besides, I am too practical. If it can't be thrown in the washing machine, it's not likely to get used. And what little boy wouldn't want to cuddle up under this cute softie? And just as I expected, my daughter wanted this one too, but I had to talk her out of it. I guess I better get working on the quilt I planned for her. 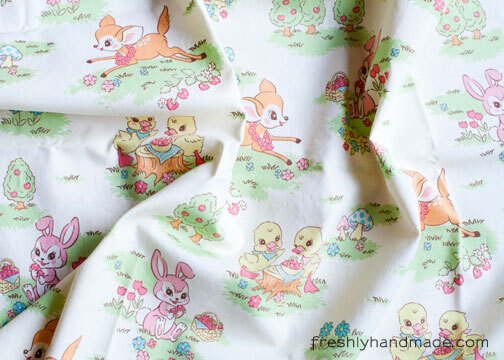 I purchased this Kokka fabric over three years ago when I knew I was having a baby girl. I absolutely fell in love with it and bought several yards. 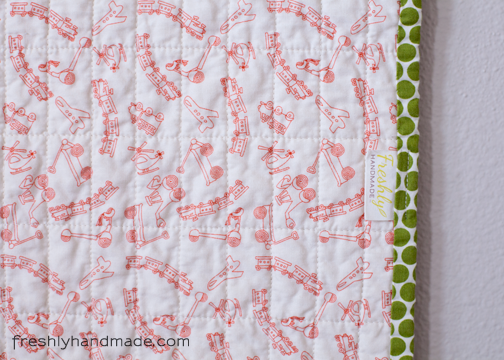 I knew this fabric would make the perfect keepsake quilt for my soon-to-be daughter. 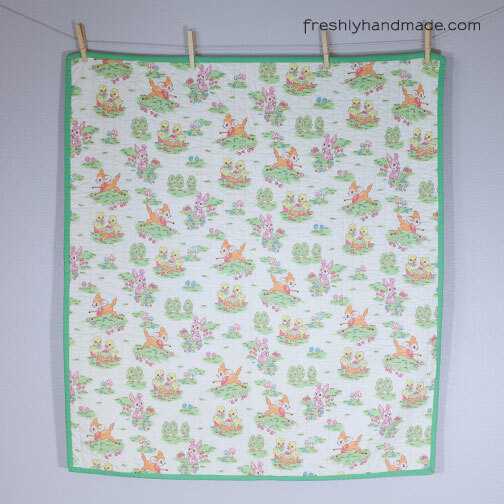 I remember buying another several yards of a pink and white tiny polka dot fabric to make a whole cloth quilt because I knew there was no way I was cutting up this insanely adorable and vintage-like nursery print. 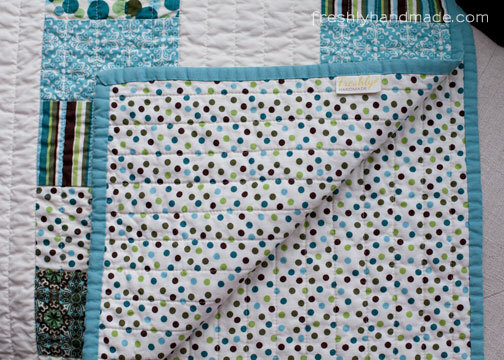 But after having my daughter, time just slipped away from me and my vision of having her grow up from birth on with this keepsake quilt didn't happen. Thankfully, I have the time now to get back to the projects that have been on hold for so long. Even though my daughter is no longer a baby, I still feel the need to create keepsakes for her and her brother. 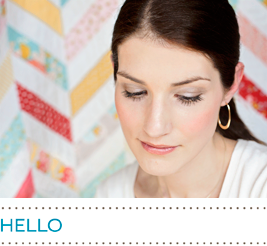 When I went to make that whole-cloth quilt, I felt like more creativity was in order. I plan to design a quilt for her that is suitable for the age that she is now, one that coordinates with her existing bedroom. In the meantime, because I have quite a bit of this fabric, I was able to design a smaller baby quilt that showcases this special fabric. I knew the backing would be made of the Kokka fabric, but I wanted to bring a fairly significant piece of it to the front as well to tie it together. 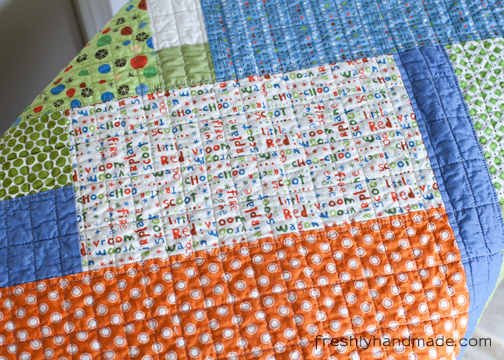 The finished size is about 37" x 40", perfect for a keepsake baby quilt or a stroller quilt. Here are some of the details. The quilt design for my daughter's quilt is still in the works. 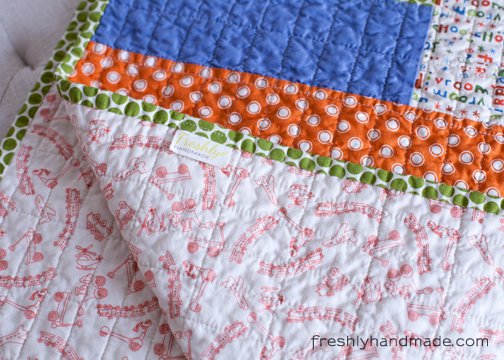 She's already expressed she wants this one, but she wants every quilt and blanket I make. I plan to publish the pattern for this quilt in the near future. 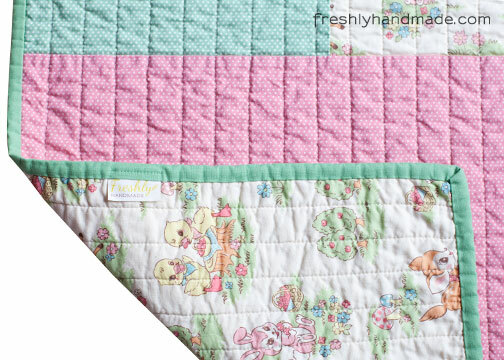 It is so versatile and I feel like I could make 50 baby quilts with this design in different fabric schemes. 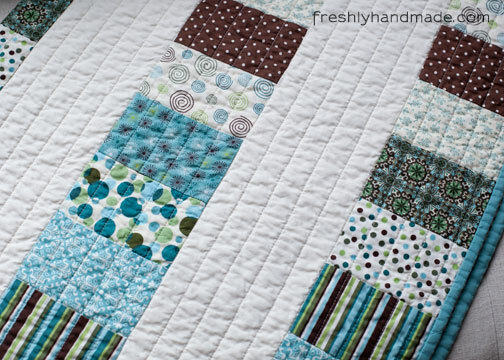 I soon will be posting a boy version from this quilt pattern. 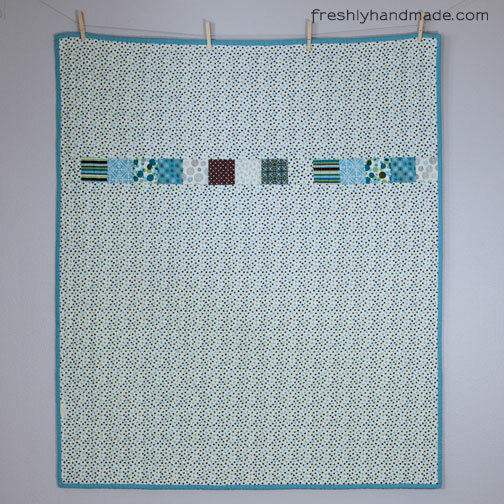 I've had this open wall space in my project room and while I contemplated filling it with beautiful wall quilts, I knew the more functional option was to create a design wall. 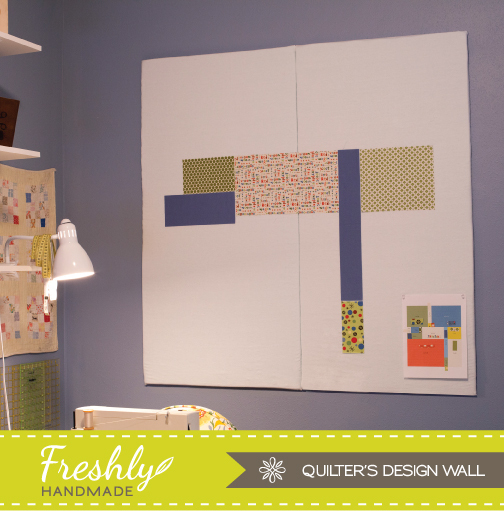 A design wall helps a quilter to temporarily display fabrics and quilt blocks before they are sewn together. 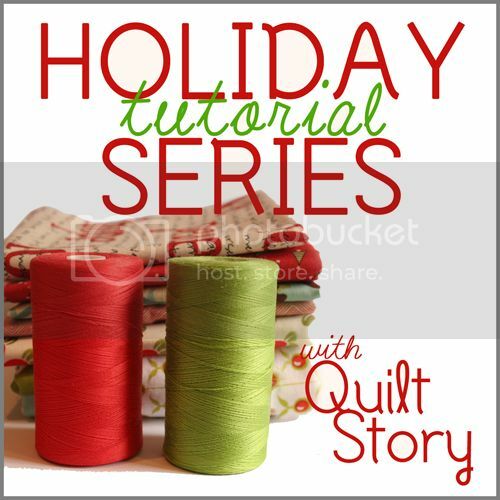 You can move your fabric around until you create the right design for you. There are many different options for creating a design wall. There are manufactured design walls that you can purchase, and many ideas on the web for creating your own. The most simplified design wall can be created by hanging a piece of flannel on your wall, but I knew I wanted mine to be clean looking and multi-functional. Not only did I want it to display my fabric, I wanted to be able to pin coordinating patterns or notes to it as well. That is why I chose the materials I did. 1. Have someone hold the pegboard up against the wall. Use the level to make sure it is straight. 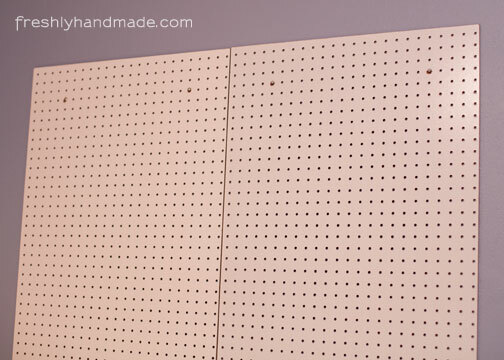 Make marks onto the wall through two of the peg holes near the top of the board about 4" down and 4" in from the sides. Also make sure to mark on the board which holes you used. I also made a mark toward the bottom center of the board. Repeat for the second board that will hang next to the first. It's a good idea to leave a slight gap in between the two boards to allow for the flannel. 2. Remove the board from the wall. 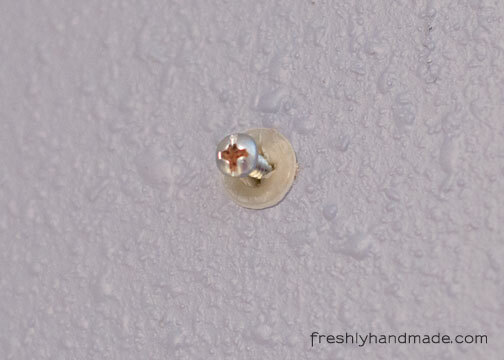 Where the two marks are on the wall, insert your anchor and screw, leaving the screw out just enough so that the board will lay flat when it is hung. 3. 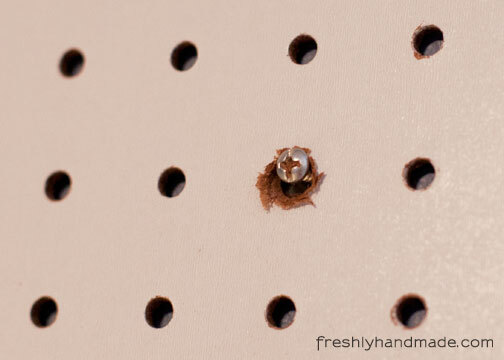 With the drill and a large drill bit, enlarge the marked holes on the pegboard enough to where the screw head will fit through the hole. I did this by inserting the drill bit through the hole and moving it in a circular motion to create a bigger hole. 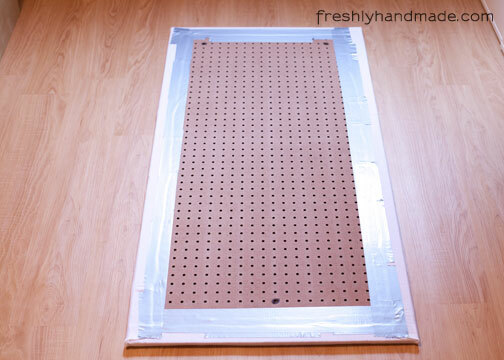 This is what the two pegboards look like hanging next to each other. 4. 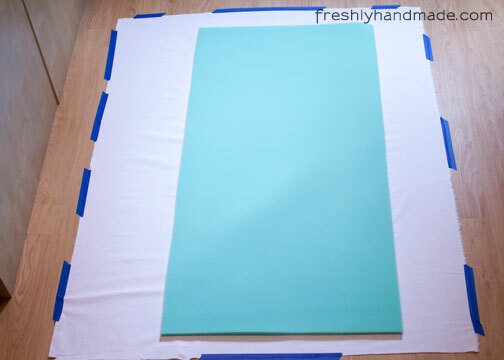 Iron the flannel and lay it flat on a hard surface. I used the floor. 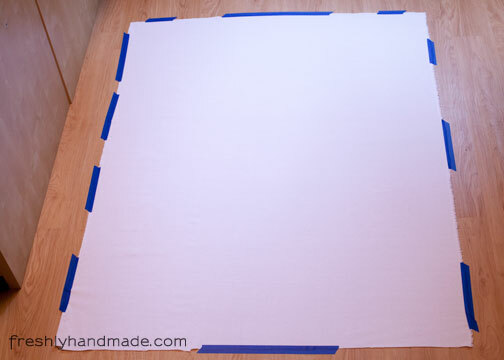 Tape the flannel down using painter's tape so there are no wrinkles. 5. Lay the foam in the middle of the flannel. 6. 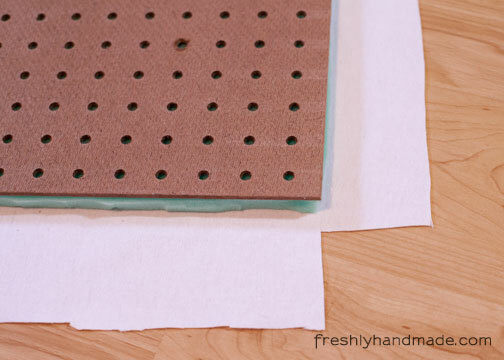 Lay the pegboard on the foam facedown. 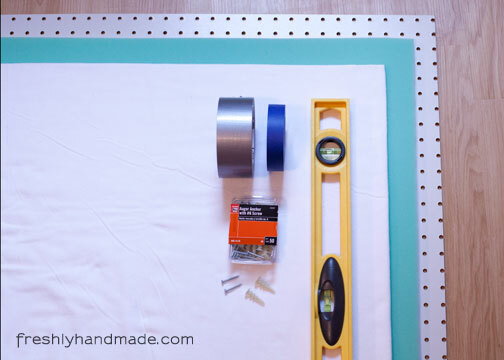 Trim the foam to the size of the board as needed. Mark where the larger holes are located on the back of the board. 7. Cut the flannel so there is approximately 2-1/2" of flannel on all sides of the board. 8. At all four corners cut a square from the corner of the flannel. 9. 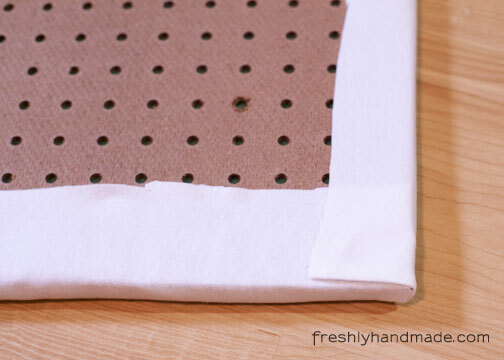 Fold the flannel over the pegboard. 10. Adhere the flannel to the board with duct tape. 11. Repeat these steps to create the second board. 12. 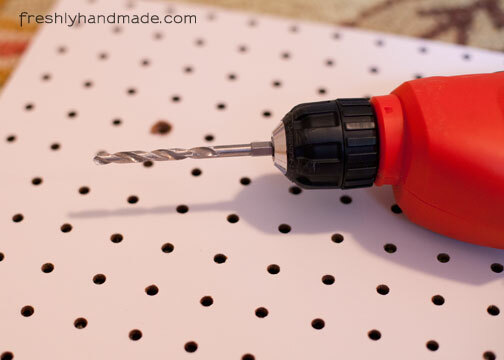 Hang the boards by aligning the marked holes with the screws in the wall. 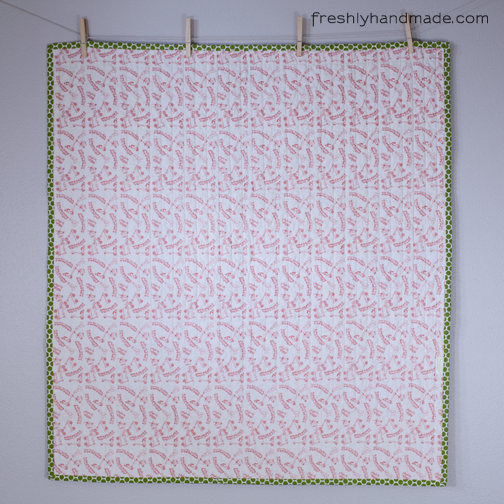 Now you are ready to hang your fabric. No pins are required because the fabric "sticks" to the flannel. 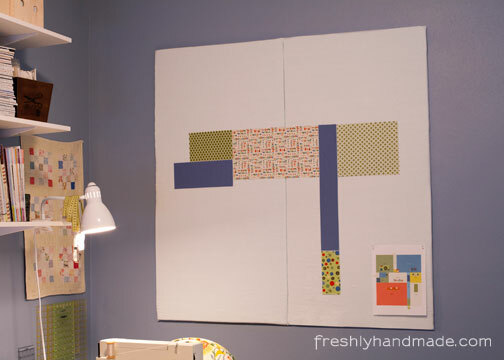 I like that I am also able to pin my pattern to the wall while I am designing. My design wall has been very useful when I am selecting fabrics. 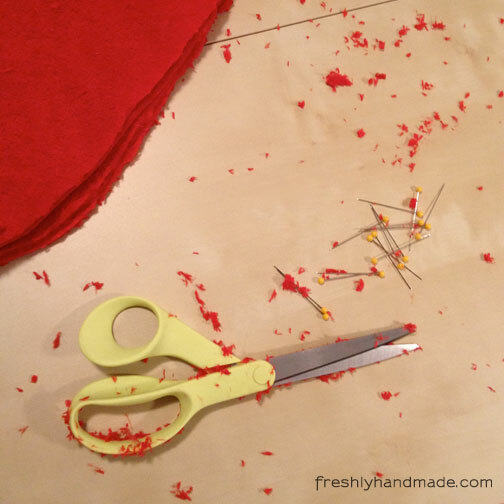 I am able to visualize what my quilt will look like before it is sewn together and can make changes on the fly. It keeps my work space cleaner as well.